Today is Garden Bloggers Bloom Day, a meme started by Carol at May Dreams Gardens. Time to catch up on what's blooming around the world today. In my little world, let's start with this lovely goldenrod, 'Golden Fleece'. It's a diminutive plant only reaching about 15" tall and 24" wide. Behind it is Nasella tenuissima (Mexican feather grass). I love that grass but some beasts keep sitting or sleeping on it. I brought this grass from my old garden in Austin. This poor sedum is struggling to survive the thug of a salvia above it. 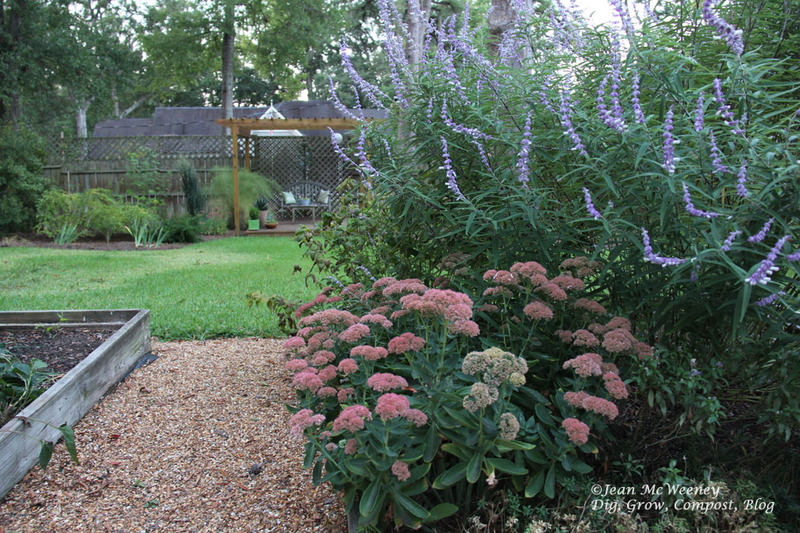 I love Mexican bush sage but this one has taken over almost the entire 8- by 8-foot square bed! Besides not liking how big this salvia got, I'm not that enthused with the color. A few years back I had an intensely brilliant deep purple one that I loved and that stayed in bounds. Alas, it succumbed to a freeze. This 'Fireworks' cuphea is a bit of a miracle. Most cupheas don't survive winters here. After a freeze last winter I cut it back instead of pulling it out and there you go - it came back. Granted, only one out of three did. But still I'm glad one did. Nice little blooms but I wish the plants wouldn't elongate like that. They always do that when about to bloom. They're supposed to not do that if you keep them in bright light but if I gave it full sun, it would fry here. Bright light on the west coast is way different I think. I'm finally getting some blooms on my moonflower vine (I planted the seeds pretty late). These vines put on lots of green growth at first. I wonder if that's because I had sweet peas planted here previously and they added lots of nitrogen to the soil?? 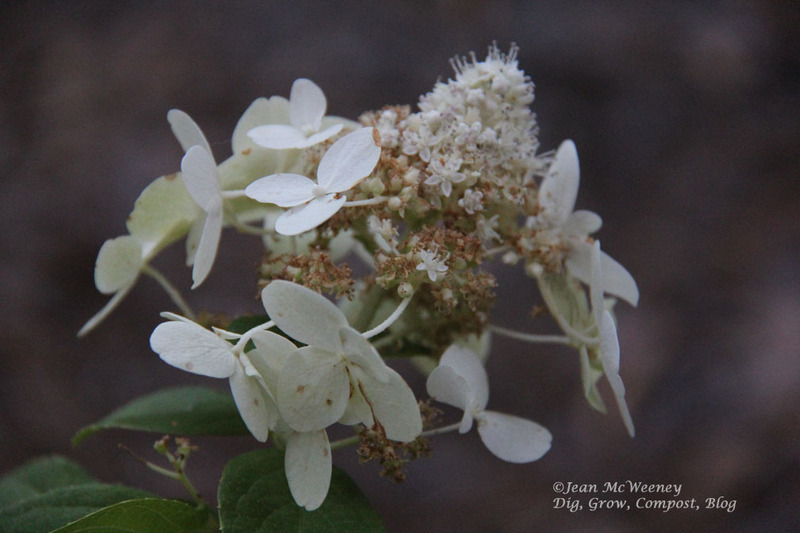 I'm thrilled to see multiple blooms on this little Mystical Flame hydrangea this year. It's its first year for blooming. I got it as a 4-inch baby in 2010. I almost ripped it out in 2011 during our extreme drought when I was against all water loving plants. But because it never really flagged, and because it was half hidden behind a large tree, I let it be. The blooms are supposed to turn burgundy red after this creamy stage. I should have taken a long shot of it because it's only about a foot tall and wide right now. Mature height should be 4 feet. I hope you visit Carol's blog to see links to more GBBD posts. Fall is almost here, yay!! This post was written by Jean McWeeney for my blog Dig, Grow, Compost, Blog. Copyright 2012. Please contact me for permission to copy, reproduce, scrape, etc. 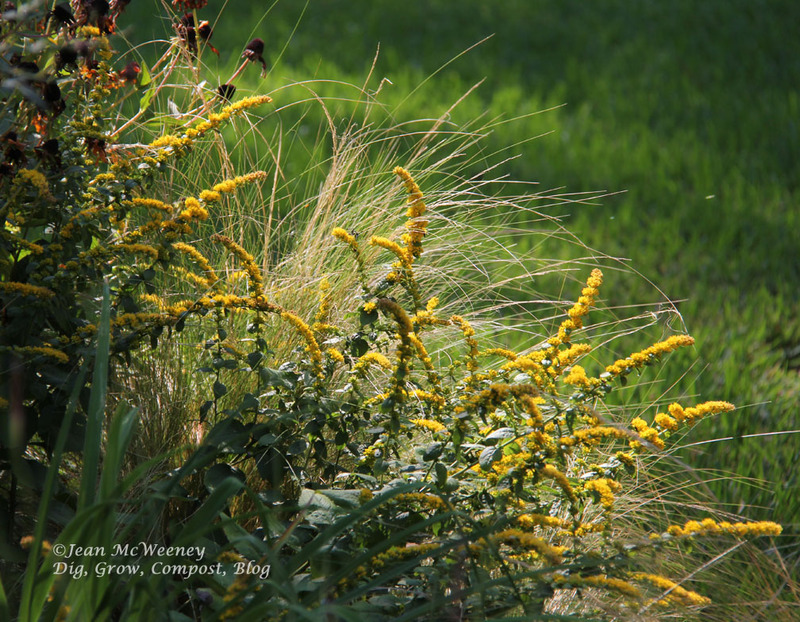 I love the 'Golden Fleece' goldenrod with the nasella. I saw some nasella at a nursery the other day, but in a fit of parsimony, I didn't buy it. I wish I had now! I've found you have to be careful with nassella since it can reseed. But here it only reseeds where it's extremely well drained, like the cracks in our driveway! Autumn joy and Salvia go really well together. I am sure the hummingbirds are grateful as they set off on their long fall journey. 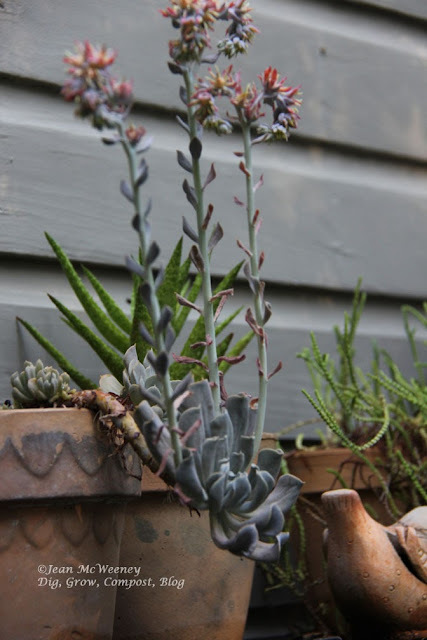 I have that echeveria but had no idea it was called topsy turvy. Such a weird little plant with all those plantlets along the stem. I just don't know what to do with it. It did flower while I was gone which was a disappointment. Happy bloom day. I have that Mexican bush sage, too, and I have mixed feelings about it. Love the moonflower. Happy GBBD! 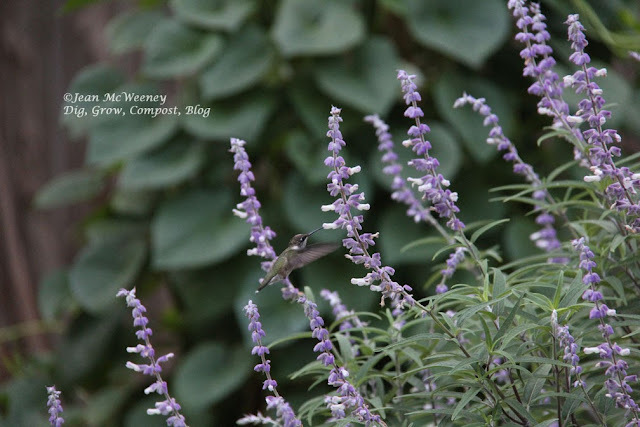 Beautiful blooms plus bird and butterfly - great post for Bloom Day! I'm amazed that Golden Fleece is short for you, it and Solar Cascade are way above their advertised heights. Perhaps next year I will cut them back early to see if it makes them shorter. I see a lot of the Mexican Bush Sage when I visit San Francisco, it is lovely but sad that it is a thug. 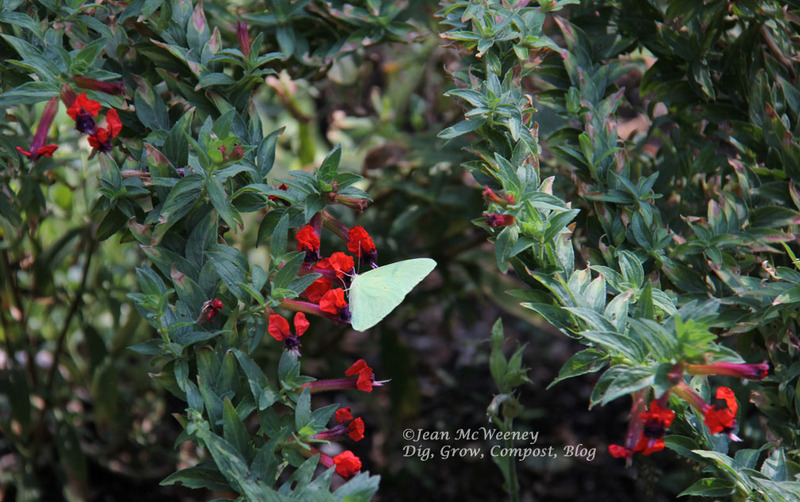 I don't generally appreciate Sulfur butterflies because the cats like my cabbage plants, but they look great with red flowers. 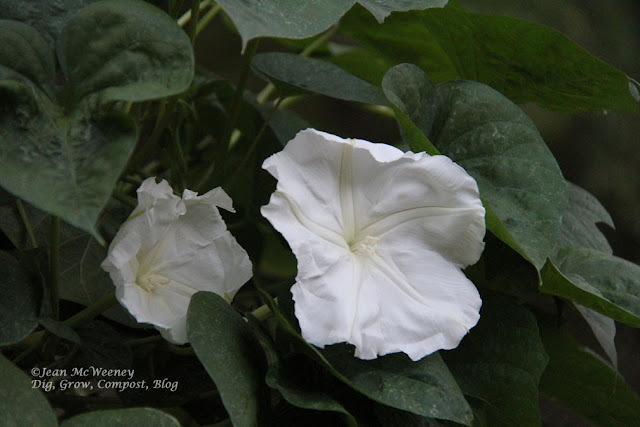 Does the Moonflower smell wonderful? Hannah, I never cut the goldenrod back. Not sure if that's why it stays short. But it's definitely the size I wanted there. I just need to cut the black-eyed Susans back to give it some room! Not all Mexican bush sages are thugs. But this particular one certainly is! Thanks for the tip about the part shade, Dee. I might try that grass in part shade next year. I don't really care that much about it blooming. That is a huge Sage! I thought it was a butterfly bush at first:) I understand your not liking its size, but the hummers would no doubt be disappointed if you took it out. Congrats on your hydrangea! I have one that I thought I killed in 2010 or 11, but this year it's finally putting out some foliage. Sometimes it pays to have patience. Happy Bloom Day! 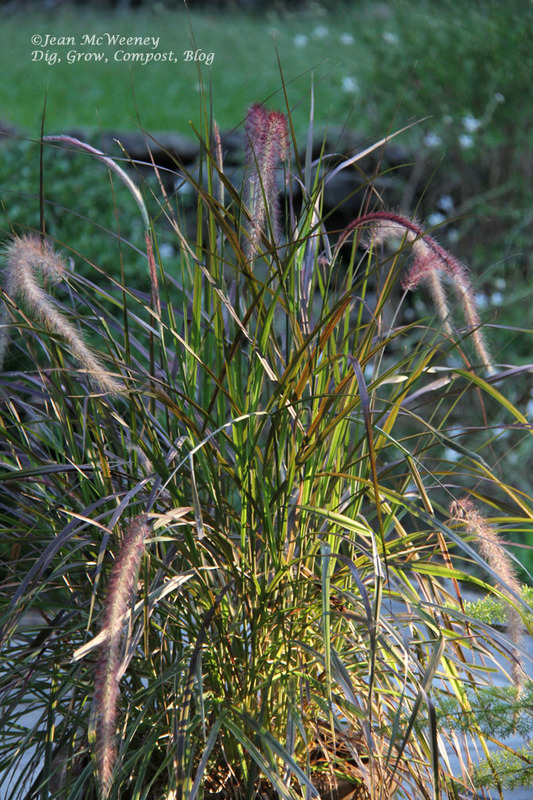 Jean, I think 'Fireworks' pennisetum needs cooler temperatures to show its true colors (or allegedly true). Here on my corner of Katy, I've noticed that the paler colors are more prominent when the temperatures drop. Thanks to CTG I just found your blog and love it! I'm looking forward to browsing through your past posts. Your garden is beautiful! Haha, Layanee. My guess is the soil pH there is fairly neutral. Last winter and spring I grew sweet peas there so my guess is they fixed nitrogen in the soil.